The Air Forces Memorial at Runnymede commemorates by nam e over 20,000 airmen who were lost in the Second World War during operations from bases in the United Kingdom and North and Western Europe, and who have no known graves. They served in Bomber, Fighter, Coastal, Transport, Flying Training and Maintenance Commands, and came from all parts of the Commonwealth. Some were from countries in continental Europe which had been overrun but whose airmen continued to fight in the ranks of the Royal Air Force. Peter was born at 66 Elwell Street, Upwey, the son of Thomas George and Beryl Fellowes (nee Christopher). Beryl lost 2 of her brothers in WW1. 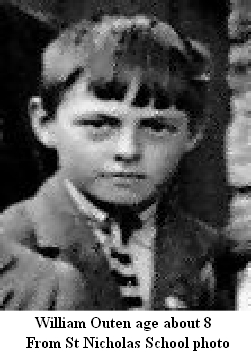 One of 5 children; Joy, Bill, Pat and Beryl were his siblings. Peter went to Upwey School until he was 14 years old. He was then apprenticed to a carpenter. 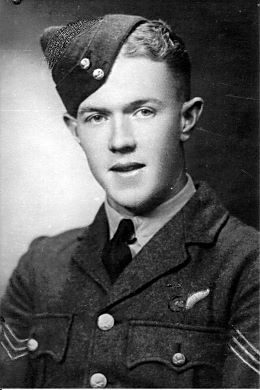 As soon as he was old enough he joined the RAF (about 1941) and trained in a Wellington Bomber aircraft (S for Sugar). He came home on Embarkation Leave as he was on an Aeroplane Ferrying Flight - he went from Portreath in Cornwall, the first stop being in Gibraltar, but the plane never got there and he was reported missing on the day he left - 25 February 1943. Pat was 16 at the time and Peter was 22 - it left the whole family devastated as he had promised to send a telegram to their Mother when he reached Gibraltar - but when she opened the telegram it was to say he was missing as the plane never reached Gibraltar. In response to an enquiry from Pat Wills (Peter's sister) in 1995, the Air Historical Branch f the Ministry of Defence provided the following information: 'Our records show that Sgt Fellowes was a wireless operator/air gunner on Wellington number DF683, which was operating with no. 21 Operational Training Unit. The aircraft took off rom RAF Portreath at 0412 hrs on 25 February 1943 for a transit flight to Gibraltar, bt failed to reach its destination. No messages of any kind was received after take off, and as the route taken laymainly over the sea it can only be presumed that DF683 must have come down into the sea (cause unknown) with the loss of the entire crew.' The crew consisted of a pilot, navigator, air bomber and 2 wireless operators/air gunners. The Fellowes family lived at 66 Elwell Street for many years, daughter Pat married George Wills and lived in the same house. George died in 2002; in 2005 Pat moved away to live with one of her two daughters, but still keeps in touch with the village. Country died/cemetery or memorial: Netherlands; ARNHEM OOSTERBEEK WAR CEMETERY; 30. B. 3. Son of Albert George and Hilda Maud Gould, of Mount Linton, Dorchester Rd, Upwey,. Mr & Mrs AG Gould of Mount Linton, 846 Dorchester Road, Upwey are among parents who have been waiting anxiously for news of their sons at Arnhem. Now they have been officially informed that their 21 year old son, Driver KG Gould, REME (Airborne Division) lost his life in that battle. For three weeks Mr & Mrs Gould had no letters from him and in their anxiety wrote to the War Office. A reply stated that their letter had been forwarded to the REME records office, and later they received the dreaded news. Shortly after the battle they heard of his death from a corporal with whom he fought, but they would not give up hope until they were informed officially. 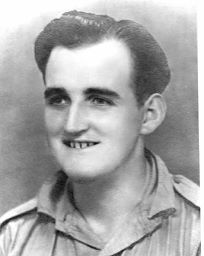 Born in Upwey and educated at Broadwey School, Kenneth was a popular member of Upwey and Broadwey Home Guard. He was in business with his father until he joined up in 1941. He fought in North Africa, Scily and Italy. Len Smith's memories: Kenneth was the son of Butcher Gould, who's shop was at 717 Dorchester Rd. Following the Normandy landings of June 1944, the Allied advance through northern Europe was extraordinarily rapid and on 11 September 1944, the Second Army entered the Netherlands just south of Eindhoven, the first Allied troops to set foot in the country since its fall in May 1940. Their next aim was to cross the Rhine before the Germans had time to reorganise after their recent setbacks, securing crossings over the rivers and canals that stood in their path at Grave, Nijmegen and Arnhem. 'Operation Market Garden' would involve the United States 82nd and 101st Airborne Divisions, the Commonwealth 1st Airborne Division and the Polish Parachute Brigade. On 17 September 1944, the 1st Airborne Division began landing west of Arnhem, but German resistance, bad weather and problems with supplies and reinforcements led to heavy losses, and their objectives were not taken. They were forced to form a perimeter at Oosterbeek which they held stubbornly until 25 September, when it was decided to withdraw the remnants of the division across the lower Rhine. Arnhem Oosterbeek War Cemetery contains the graves of most of those killed during the September landings, and many of those killed in later fighting in the area. Regiment: Royal Marines, H.M.S. Galatea. Country died/cemetery or memorial: United Kingdom, PLYMOUTH NAVAL MEMORIAL, Panel 59, Column 2. Husband of Ida Green, of Upwey. News has been received that Machine-Gunner Henry William Green, Royal Marines, has been killed in action. Son of Mrs FC Green of 88 Church Street, Upwey, he joined then Royal Navy when 17. Harry was one f the best known 'regulars' in Upwey and has seen active service in many parts of the world. He is the first man in the village to have made the great sacrifice in this war. 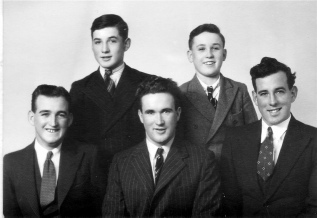 Harry was one of 3 brothers, all of whom have been in the services from youth. Frederick Walter Green has served for 24 years in the Royal Navy and is serving on a destroyer. Cheerful letters were received from Harry in which he stated that although serving in different ships, the two brothers were able to meet frequently. 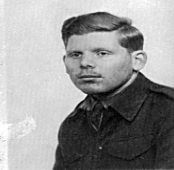 The third brother OMS Edmund John Green of the Tank Regiment, is a prisoner of war in Germany, who appreciates all that the British Red Cross is doing for the men of Stalag 18a. The death in action of Gunner Harry Green RM, recalls to mind the trio of brothers, all 'regulars' in the services, whose names were household words in the village. Our sympathy is extended to every member of his family. He is the first of our fighting men to be killed in action. One of his brothers QM Sgt Edmund J Green is now a prisoner of war, who writes home frequently and cheerfully. On 15 Dec, 1941, HMS Galatea (Capt E.W.B. Sim, RN) was sunk by U-557with three torpedoes about 35 miles west of Alexandria, as the cruiser was returning to this harbour with the cruiser force of the Mediterranean Fleet after a hunt for an Italian convoy to Libya. The commander, 22 officers and 447 ratings were lost. 144 survivors were picked up by HMS Griffin (H 31) (Capt H.St.L. Nicholson, DSO, RN) and HMS Hotspur (H 01) (Lt T.D. Herrick, DSC, RN). At 19.55 hours on 14 Dec, 1941, the Italian submarine Dagabur (Torri) had fired torpedoes at the same cruiser force in 34°01N/26°02E and heard two detonations after 1 minute 45 seconds. It is not clear whether HMS Galatea had been damaged by the Italian submarine before she was sunk by the U-boat. Regiment: Royal Air Force Volunteer Reserve, 50 Sqdn. Country died/cemetery or memorial: Germany, KIEL WAR CEMETERY, 3. F. 10. Most of those buried in Kiel War Cemetery were airmen lost in bombing raids over northern Europe, whose graves were brought in from cemeteries and churchyards throughout Schleswig-Holstein, the Frisian Islands and other parts of north-western Germany. 6 May 1942 promoted to Leading Aircraftman - Thomas Jack KINGMAN (120041). 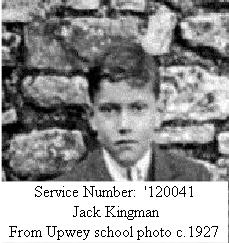 Missing from one of the big raids on Germany is Navigator Pilot Officer Thomas Jack Kingman of the RAF, whose home is at 821 Dorchester Road, Upwey. The telegram from the authorities announcing that he is missing stated that they were in communication with the International Red Cross and any further information would be forwarded. Mr & Mrs Kingman are naturally buoyed up with the hope (which has, happily been fulfilled in so many of these cases) that their son will eventually be found to be safe and in due course will be able to resume his carer in the scholastic profession, which the war has interrupted. Only a few hours before Pilot Officer Kingman set off with other big bombers he was writing home about 'another little job' That letter reached Mr & Mrs Kingman not long after the telegram to say that he was missing. 'I could not write yesterday, he stated, as I was in bed after a little job the previous night. Then we had a party in the mess last night and we are busy again today.' Mr & Mrs Kingman believe that the 'little job' was one of the big raids on Genoa. The young pilot officer (he is 25) had one miraculous escape during his training career. He was in a bomber which crashed on a hillside during thick fog. He escaped with half of one ear off and a scar on his face. Old school pals in Upwey and Weymouth will be among those who will hpe to hear good tidings in due course. Some were with him at Upwey school, then he won a scholarship to Weymouth Grammar School where academic results were even more striking and culminated in his winning a scholarship to University College, Southampton where he got his BSc degree with honours. His first school appointment was to Porchester near Portsmouth as assistant master and from there he went into the Army and then into the RAF. He was a pilot officer within 12 months and did some of this training in Scotland. He is one of a select company of golfers who can say that he learnt his golf at St Andrews. The young pilot officer combined athletics with academics in an unusual degree. He played cricket regularly for the Upwey and Broadwey cricket club and was also a good footballer and tennis player. He was about 6ft4inches in height. At Upwey Church too, he has served as Sunday School teacher and sang in the choir. He set a fine example of vigorous young churchmanship which he never failed to renew when he came home on leave. Country died/cemetery or memorial: Singapore, SINGAPORE MEMORIAL, Column 440. Mr & Mrs SA Legg of Icen Farm, Broadwey have received official intimation that one of their sons, John, serving in the RAF in South East Asia operations, is missing. They are awaiting other details and are buoyed up with the hope that there may be more reassuring news later on. John is the 3rd of 5 sons, and very popular in Broadwey and Upwey. Having joined the RAF about 3 years ago he has been serving in India for two years. Regiment: Royal Air Force Volunteer Reserve, 1651 C.U. Country died/cemetery or memorial: Germany, BECKLINGEN WAR CEMETERY, 12. A. 1. The site of Becklingen War Cemetery was chosen for its position on a hillside overlooking Luneburg Heath. Luneburg Heath was where, on 4 May 1945, Field-Marshal Montgomery accepted the German surrender from Admiral Doenitz. Burials were brought into the cemetery from isolated sites in the countryside, small German cemeteries and prisoner of war camps cemeteries, including the Fallingbostel cemetery, within a radius of about 80 kilometres. Most of those buried in the cemetery died during the last two months of the war. Son of Percy and Dorothy A. Lovell, of 650 Dorchester Road, Upwey, Dorsetshire. Regiment: Royal Navy, H.M. Submarine Porpoise. Country died/cemetery or memorial: United Kingdom, PORTSMOUTH NAVAL MEMORIAL, Panel 89, Column 3. Son of George And Hilda Maud Lucking, of 3 Goulds Hill, Upwey, Dorsetshire. In January 1945 HMS Porpoise was laying mines in the vicinity of Penang. The signal received from the submarine confirming that this had been successfully carried out was the last contact made. Japanese records show that a submarine was spotted and bombed by aircraft in the vicinity of Penang. Although not destroyed in this attack, the submarine was damaged and leaking oil, that left a trail for the Japanese anti-submarine forces to follow, and it is likely that she was sunk shortly after by anti-submarine aircraft. Complement 59. Country died/cemetery or memorial: France; RANVILLE WAR CEMETERY; I. E. 26. Son of William Ferguson Menzies and Kathleen Augusta Cheney Menzies, of Upwey, Dorsetshire. News that their elder son Duncan Menzies has been killed in action in Normandy has been received by Captain and Mrs WF Menzies of The Nest, Upwey. Lieut. Menzies was 20 years of age, educated at King's College, Taunton. He had chosen the Army as a career. From Taunton he went on to Glasgow University for a training course for the Army and then to OCTU. Trained as an artillery officer Lieut Menzies on transfer to the infantry chose the Highland division. He was very keen on athletics and played for his college at rugger. Captain William Menzies retired from farming in Cornwall in 1935 and came to Upwey, where he had been active in social affairs and is deputy Head Warden at Upwey and Broadwey. Duncan's father, Captain Menzies, was very active in the raising of funds for the building of the Upwey & Broadwey War Memorial Hall, and once the building was opened became the Booking Secretary and Caretaker for many years. The aim was to build the hall and erect a 'Roll of Honour' from monies raised. Unfortunately when the hall opened in 1956, there were not enough funds left to erect the memorial. Captain and Mrs Menzies and Mrs P Lovell, having both lost sons in the War made a financial donation to enable the Roll of Honour to be created and erected in November 1957. Regiment: South Wales Borderers, 2nd Battalion. Country died/cemetery or memorial: France; ST. DESIR WAR CEMETERY, I. A. 13. The Allied offensive in north-western Europe began with the Normandy landings of 6 June 1944. St Desir War Cemetery is the most easterly of the the Normandy cemeteries. For the most part, those buried here died in the final stages of the campaign, in pursuit of the German forces towards the Seine. Son of Wilfred Charles and Fanny Morris, of 34 Chapel Lane, Upwey. The sad news has been received by Mr & Mrs W Morris of 34 Chapel Lane, Upwey that their only son Private Kenneth Morris has been killed in action. Private Morris who was 18years9months old had been in the service six months and had been in France nine weeks. Before joining the service he was employed by Mr Vincent of Lorton Farm, Broadwey. He was in the ATC for two years and was also an ambulance attendant in the ARP service. Much sympathy will be extended to Mr & Mrs Morris in their sad loss as Kenneth was very popular in the village where he had always lived and also in Broadwey where he was educated. Country died/cemetery or memorial: Japan, YOKOHAMA WAR CEMETERY, Brit. Sec. A. C. 1. AC 'Bill' Outen who has been missing for 16 months is now known to be a prisoner of war in Japan. When his mother last heard from him he was in Malaya.